I've written several blog posts about the amazing work Therapy Dogs do to help people in need. Most of my posts are about the work I do with my Siberian Husky, Icy. 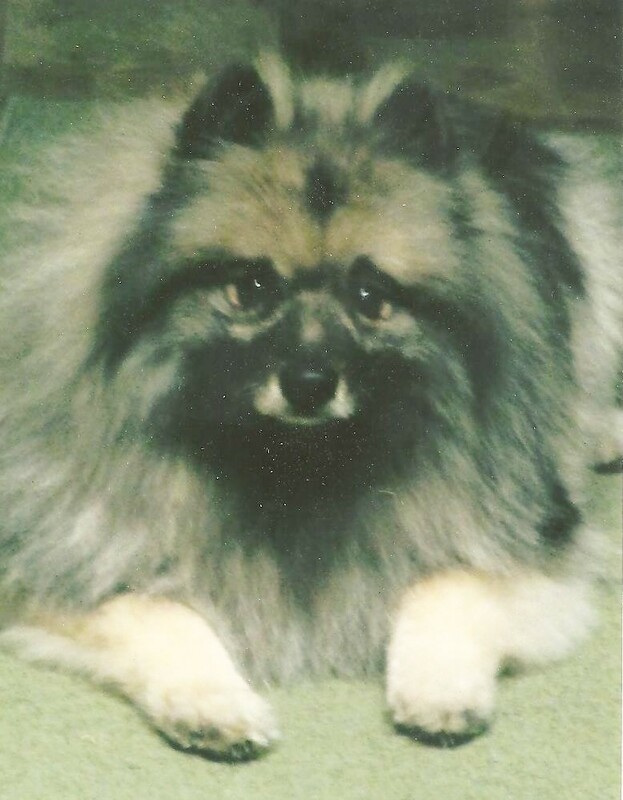 But today I want to share with you the work my good friend and fellow Pet Partners Therapy Dog handler Paulette has done with her beautiful Keeshond dog, Teebo. Paulette and Teebo visit people struggling with substance abuse, offering love, support, and comfort as they fight to conquer addiction. Teebo, Paulette's beautiful Keeshond is a great therapy dog! Paulette and Teebo participate in the children's reading program along with Icy and I. In addition to the children's program, twice a month Paulette and Teebo visit residents at a drug and alcohol recovery facility. Paulette graciously agreed to be interviewed for my blog and talk about the therapy dog visits she and Teebo have with recovering substance abusers. Paulette and I met for our interview at a café. Over cups of tea we talked for nearly two hours. Before I get started on the interview, let me clarify something right off the bat: Teebo wasn't named after the football player, he's named after the Star Wars Ewok! This is a common question Paulette gets about Teebo. Now that we've cleared that up, let's get to the interview! Paulette poses with Teebo (right) and my Siberian Husky, Icy at one of our library visits. CATHY: Paulette, how did you get started in therapy dog work, and how did you know Teebo would make a great therapy dog? During socialization and training, I noticed that Teebo loved everyone. He didn't mind it when kids or other people crowded around him, he was so comfortable and so good with people. When our PetSmart trainer Connie talked about doing a therapy dog class and asked if anyone was interested I thought "We can do that!" and signed up for the class. CATHY: How did you find out about working with recovering substance abusers? One of the other dog trainers was also a student, studying to be a social worker or counselor of some kind. She had been doing an internship at a drug and alcohol recovery facility. She thought therapy dogs would be great for the residents there and asked if Teebo and I might be interested. I agreed to meet with her boss who managed the facility. Initially, I met with him by myself, without Teebo. I didn't know what to expect, I had never been to a facility like that. As I walked around with him, he explained what they do there and how residents go through the recovery process. I didn't interact with any of the residents, who live at the facility during their recovery, we just toured the facility. Afterwards he asked "Do you think you can do this?" I said yes, I definitely could but I would have to see if Teebo would be ok with it. They didn't have a therapy dog program at the facility, we would be the first therapy dog team to visit. During our first visit, a Counselor was present to monitor the reactions of the patients and the team. It went great and we've been visiting ever since! CATHY: How is working as a therapy dog team with recovering substance abusers different than when you and Teebo work together in other programs, like the kids Reading program at the library? It's a very different scenario. When we arrive, we need to be let in and out of each locked area of the facility. When residents first arrive they are in detox for several days before moving on to other stages of rehab. Teebo doesn't have to stay in one place and sit still like he does at the library. We can proactively move through the facility visiting people. Residents may be sleeping in their rooms, in common areas, or in small groups around the facility. Teebo instinctively knows who to approach and who not to approach! Another big difference is that there is a drug sniffing German Shepherd named Draco. He shows up at random times during the day or night to ensure no drugs are present where they shouldn't be. He's a working dog so no one is permitted to touch or interact with him. The residents often ask if it's ok to touch Teebo. We always know when Draco has been there because Teebo becomes fixated on following Draco's scent from room to room! CATHY: What is the most difficult part of working with recovering substance abusers? One of the most difficult things is when they talk about their abuse, it can be pretty unsettling. Sometimes it's difficult because we often don't see the same people more than once or twice, it's new people all the time. We only visit twice a month and the residents don't always complete their full recovery. Although some residents will stay for a full 30 days, some will leave after their 5 day Detox period. Some have to leave early because their insurance won't cover any more time at the facility. CATHY: Is there a particular visit or story that sticks out in your mind that you can share with us? One of the residents asked me "Why are you doing this for us, we're addicts!?" as though she felt they were not deserving of it. Some of them seem to be so lost, and say they don't feel valuable to society. A couple of the residents have said "Thank you so much for coming, it means so much to us." when all we did was walk around and say hello! It's interesting to see some of them be so grateful that you care. It's very rewarding when you can make them smile and provide a positive interaction in their day. It's always nice when they can have a conversation with you about something other than why they are at the facility. I try to be encouraging by saying things like "Look what you're doing for yourself by being here!" I've shared the FAIL acronym with a few of the residents. I tell them "FAIL is merely your First Attempt In Learning". CATHY: What advice would you give to other animal therapy handlers who want to help make a difference by working with recovering substance abusers? Be flexible, it's different every time we visit and you can't have expectations of how you think it should be. Most importantly, Don't Judge! You haven't walked in their shoes. Be in tune with your dog to see how he or she is handling it. There was one day where we had to cut our visit short. For some reason, Teebo just didn't want to interact with anyone that day. I'm not sure why, but I had to take him home after only a brief visit. When you meet a patient, let them start talking first. Often they'll say they miss their own dog and start asking questions about Teebo like what kind of dog he is and what training we needed to do to become a therapy dog team. When they talk about missing their own dogs I'll say "Don't worry, your dog will be waiting for you when you get home!" CATHY: Paulette, thanks so much for sharing about the visits you and Teebo make to the rehab facility. I really admire how you two are helping people as they struggle to recover from drug and alcohol addiction by offering comfort, love, and support! And maybe even a few sloppy kisses from Teebo! I hope you enjoyed reading this interview as much as I enjoyed conducting it. 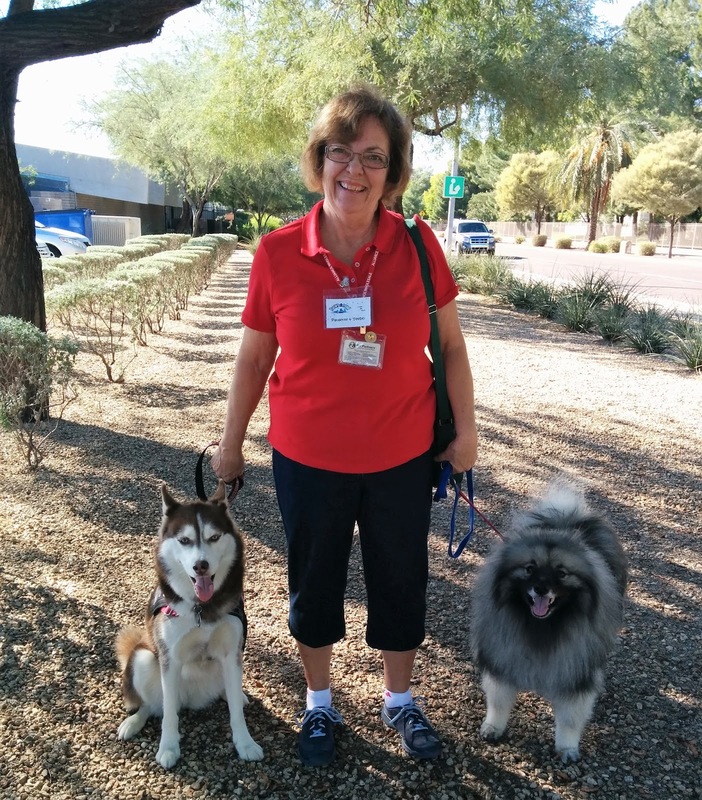 A big THANK YOU to Paulette and Teebo for giving us a glimpse into their therapy dog visits to the rehab facility. "They say I gotta go to Rehab, I say NO, NO, NO!!" The Opioid epidemic has reached crisis level in this country. I am under no illusion that a therapy dog can help cure life threatening drug addiction. But when every minute of every day is a painful struggle, a visit from a loving therapy dog can be a much needed bright spot in an otherwise dismal day. It may help an addict get through their day, and perhaps motivate them to participate in that day's therapy session. Dogs ask no questions, make no judgements. They are pure Love. I think it's a great idea for therapy dogs to visit recovering substance abusers in rehab. Unconditional love, comfort, support, and the Power Of The Paw just might help them get through the darkest moments of recovery. If you enjoyed this interview, read about Paulette and my very first therapy dog encounter at a local mall. Icy and Teebo were still in therapy dog training, but managed to give hope to a grieving young lady. What do you think about therapy dogs visiting rehab facilities? Please, leave us a comment and share your thoughts. We always love reading your comments! I'm a huge fan of therapy pets!!! They are so important! Sadly, in Belgium they are not allowed in hospitals. Something needs to change, soon!! That's a shame, therapy animals can be great "medicine"! I hope that changes soon. Thanks for stopping by our blog! What a great idea. Kudos to you! Such a lovely story! I imagine these folks are helped and comforted so much by Paulette and Teebo. Dogs are so accepting, they don't judge and I bet this is especially helpful for those struggling with addiction who may feel ashamed and isolated. I still hope some day to have Ruby become a therapy dog. She still has her own set of issues so we are not ready yet. She's so loving and gentle that I know she would be great especially with children. They really are a great team, I'm glad you enjoyed their story! This is very dear to my heart. As someone who has very close people in my life who are recovered addicts, I can say that I'm so grateful for this. It breaks my heart that someone thought she wasn't worthy of the company of a therapy animal. Thank you for the post - it really helps spread awareness. Thanks so much for sharing that Amanda! It broke my heart too when Paulette told me some of the people at the rehab center felt that way. That's beyond sad. I hope it does raise some awareness. I think this is the first story I've read about therapy dogs visiting rehab facilities. Paulette and Teebo do great work! It was the first time I had heard that as well, but I'm so glad Paulette & Teebo are helping these folks. Wow, I had no idea that therapy dogs were for rehabs too. The answer about the lady who asked why you guys were helping - that broke my heart. It's so easy for people to see addicts as bad people, but so many just need help , and none of them intended to reach that conditon. I've been wanting to get into it with Matilda, though she's pretty shy at the moment, so I'm not sure if she'd be a good candidate. I think it's so wonderful too that Paulette & Teebo visit recovering substance abusers. I'm sure it makes a difference for them. My heart goes out to them, it's so hard to break addiction, they need all the support they can get. Work on Matilda's shyness with her & hopefully she'll get there! I think it's wonderful too, I really admire Paulette & Teebo for the important work they do in the community. What an amazing and wonderful story. Dogs and therapy dogs can do so much for so many without ever speaking a word. Well done! You're so right, dogs can help so much just by being their wonderful, loving selves! I'm glad you enjoyed the interview. I agree! They're a great therapy dog team. Awesome post! I used to think therapy dogs were only used in hospital type settings, but I've been learning a lot lately about all the different ways therapy dogs bring joy to people. So glad you enjoyed the post! There are so many ways in which therapy animals give back. Therapy dogs fill such a valuable role! I'm really impressed with Paulette & Teebo too! They're a great team, so caring & giving. thank you for sharing about this. I've taken steps to get my cat Sophie certified as a therapy cat. This just inspires me even more to finish! How wonderful!! I'm so glad you found this story inspiring. I look forward to Sophie becoming a therapy cat! Great story...therapy dogs are so awesome! Thanks Kia, I think they're pretty awesome too! Beautiful, touching article! We work with children's cancer programs - and it is painful, joyous and beautiful all at once. I love your statement about failing and it's just your first attempt at trying - so uplifting!! Im really glad you enjoyed the post & found it uplifting! Thanks for all you do for children, I can understand how it must be both joyful & painful at the same time. It's so worth doing though, it's such meaningful work to help children. This is great! I love the work they are doing and I am sure you are one proud fur Mom! Thanks Diane! I love that Paulette & Teebo are helping people who struggle to conquer addiction. They are such a special therapy dog team! How wonderful that Teebo can help out the humans in need. Yes, Teebo is a very special dog! I agree, therapy dogs can do so much to help others. I love seeing the reaction that people who are hurting have when a dog goes over & puts a paw or their head in the person's lap! They can make a real difference! Thanks Mary! Yes, it really was heartbreaking to hear that she felt they weren't worthy of a vist. It must be so awful to feel that way about yourself. Me too, I think it can really make a difference. Thanks so much for tweeting this, I appreciate that! Great interview. We love celebrating therapy dogs - they make a huge difference in the lives of people they visit. Thanks, I'm glad you liked the interview! I agree, therapy dogs & other therapy animals can make such a difference for people in need. Love this!! I have always known that dogs have so much to give and can help people in so many ways. They never judge and give such an amazing love. I feel that being loved by a dog helps people to be better. I know I am a better person for my dogs!! So glad you enjoyed it, Julie! I fully agree, dogs have so much to give, they can do so much to help people. What a terrific therapy program. I haven't heard of therapy dogs working with addicts before, but it makes perfect sense. I hope more addiction facilities will start having a therapy dog program. 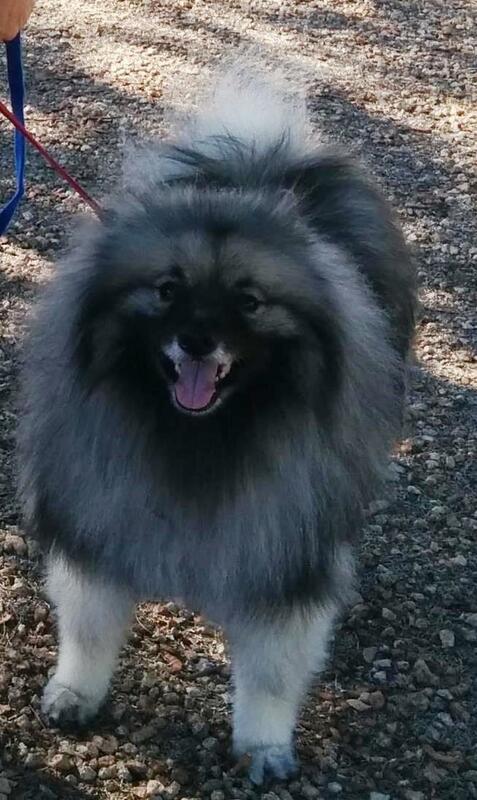 Teebo is so handsome and looks like a real love! It is a great program. It's probably not very common in rehab facilities, but I think it could be so helpful! I had no idea that therapy dogs were being used in working with substance abuse patients. This is truly inspiring! Thank you for sharing Paulette and Teebo's story. Thank you, I'm so glad you enjoyed the interview. It agree, their story is so inspiring. I hope more facilities like this start therapy animal programs. My Dog Is A Canine Good Citizen! Which dog wore it better?